The HEROCLIP is an infinitely handy hybrid: the functionality of a carabiner combined with a 360º hook. 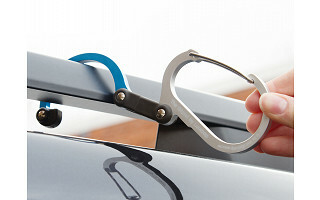 The hook’s thin profile fits into tight spaces while its rubber cap prevents slippage and holds onto thicker surfaces. Maker Mina Yoo came up with the concept while climbing Mt. Rainier, with nowhere to rest her backpack but the muddy earth. Her hanging tool for keeping gear off the ground turns out to have hundreds of other applications. Attach a carry-on bag to a suitcase for easy transport. Hang a bicycle in the garage. Keep gym bags off the floor, dirt- and germ-free. Secure a diaper bag to free up your hands. Clip shopping bags together for faster carrying. Fasten a lantern to a tree at a campsite. 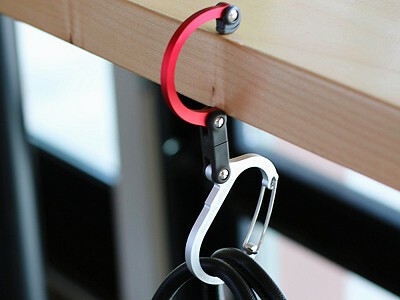 For easy storage, an interior magnet holds the hook securely against the clip. Bring the HEROCLIP along anywhere, because indoors or out, its utility is only limited by your imagination. Hi everyone! I'm Mina, the founder of HEROCLIP. My goal was to create a multi-purpose tool that makes it easier to carry your gear, no matter what you're doing or where you're going! I'd be happy to answer any questions you have. Interested in your product but it seems very thick. My new scooter, Piaggio 350, does NOT have a place to hang and lock my helmet when I park. I am looking for a hook for that.. but it would need to be thin enough to go under the seat when I close it.. this looks a bit thick. Thoughts? @Sue The description says that it is 1/2" thick. Brian is right (thanks Brian!). It's widest point measures 1/2 inch thick at the hinge but it tapers and the majority of it is 1/4 inch thick. Mina will be here shortly and will be able to answer more specifically. @Brian The specs are not listed until the "buy" page. They should be in the description, please. @Sue I used to have a Piaggio! The widest portions of the qlipter (the rubber piece and the hinge) is 1/2". The hook portion is 3/8" thick and the biner portion tapers from 3/8" to the nose which is 1/8". Hope this helps! Is the 4 5/16" measurement Qlipter extended or tucked? Please put the specs up front on the shopping page; some people won't click on 'buy' to find them. @Bernadette The 4 5/16" measurement is with the qlipter closed. It is 7 3/4" when extended. This size is ideal for fitting over thicker bars, branches and tables. @Mina....thank you for providing this information. @Bernadette - we do collect and publish all the specifications and product details but the information presented one level down on the individual product page. You will find it if you click the buy button. We are aware that this is not ideal, and looking to correct it in our next website update. @juan Thank you for your question! We are currently working on designing a smaller version (tentatively called "the qliplet"). We will make sure that we let you know when it is ready to go on the market. The qlipter is manufactured in China and each run is inspected by two well known inspection companies. Thanks for the questions. More sizes and other versions may be available in the future (sounds like there is demand!) so we'll be sure to update our community when that happens. The Qlipter tool is manufactured in China. The Qlipter will hold up to 50 lbs. This information is always found in the details portion which you will find when you click into the box that says "Buy". The red is Phoenix Rising - good question! @Amy I'm having similar color questions. It would help if the photos of each had the color name shown. Which one is black? @jane The black is "Thunder." I have asked the Grommet team to put color descriptions in parentheses. Great idea but am glad you are looking to manufacture a smaller version as this is bigger than I would want. Thanks. 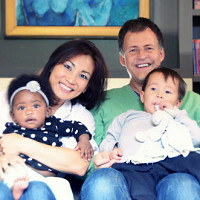 @Ann Hi, Ann, please join our mailing list so we can let you know when the smaller is available! The current qlipter's size was determined after testing lots of sizes to maximize utility (diaper tables, thick tables, thick bars, branches, walls); the smaller version will be more specialized gear. Thank you for checking out the qlipter! @Mina I am also interested in a smaller version. Is the price for (1) Qlipter? - or is it a pack of 4? - Looks like a versatile product, however, if it's just for (1), then the pricing is a little on the high side. The $20 price is for 1 Qlipter. The price is a bit higher than your typical inexpensive clip found at the store, but this is far more versatile as it's a carabiner and a mega-strong clip that can hold up to 50 lbs. would you please identify which colors are which? Hello Mina, Is the $20 cost for a single Qlipter? @Michael Hi Michael, yes, $20 for one qlipter. GREAT item! Is this cast aluminum or forged? Just wondering, though it DOES hold 50 lbs., so pretty hefty. @Mary Hi Mary, thank you! It is cast aluminum. It has been through many tests, and it holds 50 lbs with no issues. I almost backed on kickstarter.... Glad to. See you're succeeding Mina! @Robert Hi Robert! Yes, things are going very well! Thank you for your note! Mina, I just ordered one and I wanted you to know that I have a use for your Qlipter that you might not have thought of. I adopted a kitten from a shelter aka Rootin-Tootin. She is 5 months old and she gets into everything. I have a nice leather bag that I will hang up once your clip arrives. It will prevent Rootin-Tootin from playing with the straps and clawing it. Thank you. Hi, This looks like a great idea! One question, is the hook rated at 50 lbs or the carabiner? or both? Just wondering if what the biner is able to carry. Perhaps this was already addressed. Thanks! I'm buying a few for stocking stuffers for Christmas. @Jenifer Jennifer, you are right to ask that question. The product's recommended weight is 50 lbs when it is fully extended. When it is closed and used as a biner, it can hold a lot more, but this has not been tested as the primary feature of the qlipter is that it can open up. However, now that you have brought this up, I will get the closed version tested. Thanks for the thought! I am so happy you are getting them as gifts; they would make wonderful stocking stuffers! 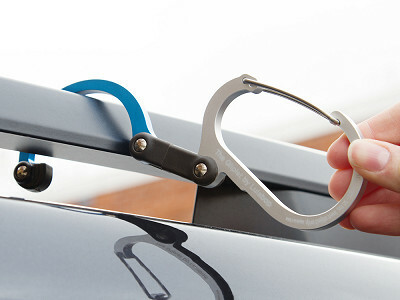 The HEROCLIP is an infinitely handy hybrid: the functionality of a carabiner combined with a 360º hook. The hook’s thin profile fits into tight spaces while its rubber cap prevents slippage and holds onto thicker surfaces. Maker Mina Yoo came up with the concept while climbing Mt. Rainier, with nowhere to rest her backpack but the muddy earth. Her hanging tool for keeping gear off the ground turns out to have hundreds of other applications. Attach a carry-on bag to a suitcase for easy transport. Hang a bicycle in the garage. Keep gym bags off the floor, dirt- and germ-free. Secure a diaper bag to free up your hands. Clip shopping bags together for faster carrying. Fasten a lantern to a tree at a campsite.